Ononis alopecuroides (foxtail restharrow) is a woody annual (family Fabaceae) whose current distribution in California is limited to one location in San Luis Obispo County. This Mediterranean native prefers disturbed places, such as fields and pastures, as well as grasslands and oak woodlands. 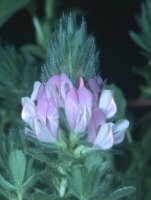 Although the one known population is almost completely eradicated, foxtail restharrow has the potential to be a highly aggressive invader, forming dense stands that exclude native plants. It is considered weedy in northern and central Europe.